© 2008 The Flubber Gallery. All rights reserved. All images by Abby Weissman from the Flubber Gallery collection. 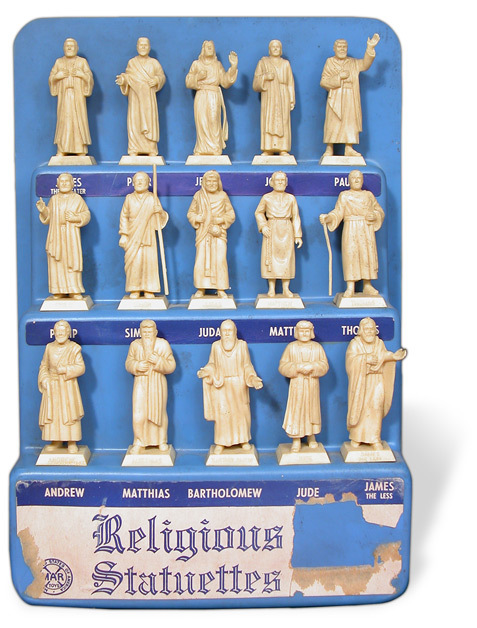 This uncommon blue plastic store display (above) features Jesus and the Apostles, also from the early-to-mid 1950s. Although it is not in the greatest shape, it features the rare, left-handed Jesus, as well as the older MARx logo. The figures represented are: John, Peter, Jesus, Paul, Matthew, Andrew, Thomas, Philip, Simon, Jude, Bartholomew, James the Greater, James the Less, Judas, and Matthias. In the early 1960s Marx sold handpainted versions of these same Jesus and the Apostles figures. They were packaged individually in colorful open-face Cathedral-like boxes.